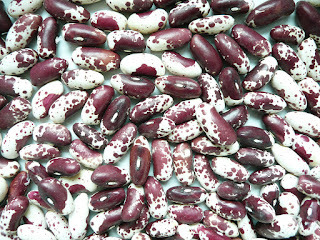 For the sake of simplicity, I classify beans in 2 categories: Bush and Pole. Bush beans are usually compact and grow close to the ground. 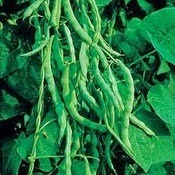 Pole beans climb and require a trellis or other support. Bush beans tend to produce more beans in a shorter time, while pole beans will produce more over an entire season. Pole beans typically require much less garden space since they grow UP. Two weeks before planting, work compost or fertilizer into a garden spot that receives full sun. Well after the fear of frost has passed, use a garden hose to lightly moisten the soil. Plant bean seeds directly into rich, fast draining soil in spring after the soil has warmed. For bush beans, form 1inch-deep furrows and place beans every few inches. For pole beans, position the trellis or bean teepee before planting the seeds. Plant several seeds in each 1-inch furrow. Cover all seeds with soil and water well. Keep the soil moist until the seeds germinate. When seedlings sprout, carefully thin them to one plant every 6" to 8". Apply a generous layer of mulch around the plants to conserve moisture and prevent weed growth. Bean plants need about 1" of water per week. They should be watered in the morning so the foliage has time to dry before dark. Fertilize bean plants with an organic fertilizer every two weeks for the first six weeks, then once every three to four weeks. Keep an eye out for bean beetles, which are easily picked off by hand and terminated. The plants require full sun and regular water. 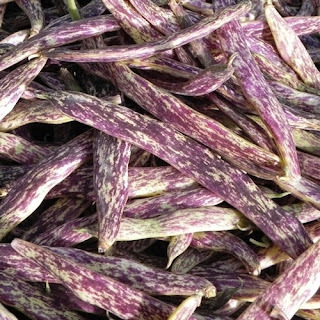 In general, bush beans mature faster and are less sensitive to drought and extreme temperatures than pole beans. Provide support for vines in the form of a trellis or pole. Tip: Never work around bean plants when they are wet. Disease can quickly spread from plant to plant, destroying an entire crop. Beans have minimal fertilizer needs compared to other warm-season vegetables, partially due to their ability to fix their own nitrogen. We use our own DIY Organic Liquid Fertilizer mix. If the leaves of the plants begin yellowing at mid-season, a second application of nitrogen-rich fertilizer is beneficial. Organic matter also aids the growth of the bean plants. Compost, whether it is home composted materials or a purchased compost, adds nutrients to the bed while also aiding drainage. Beans do not tolerate soggy soils so composting the beds is particular necessary in clay soils. All beans enrich the soil with nitrogen fixed form the air, improving the conditions for whatever crop you plant after the beans are finished. In general they are good company for carrots, celery, chards, corn, eggplant, peas, potatoes, brassicas, beets, radish, strawberry and cucumbers. Beans are great for heavy nitrogen users like corn and grain plants because the nitrogren used up by the corn and grains are replaced at the end of the season when the bean plants die back. Summer savory deters bean beetles and improves growth and flavor. Keep beans away from the alliums. CLICK HERE for more unique Heirloom Bean varieties.